Cospaia 1441takes its name from a tiny independent republic, created by a topographical error, which for almost four centuries, from 1441 to 1826, became a place of freedom between the Grand Duchy of Tuscany and the Papal States. 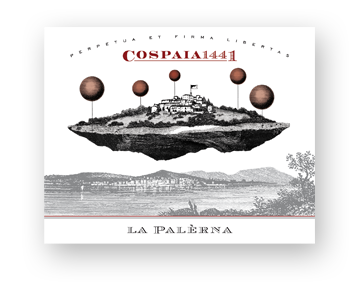 This little-known historical adventure inspired the label of Cospaia 1441, designed by Studio Doni & Associati, on which there is a metaphysical vision of the legendary land crowned with its motto “Perpetua et firma libertas” (firm and perpetual liberty). Aroma: intense and lingering, fruity and spicy, with fine and elegant notes of berries, leather and tobacco. Taste: complex and mouthfilling, with a long finish. Pairings: aged cheeses and wild game.